All Dressed Up . . . . The cupcakes were baked, decorated, and ready to be nibbled on in a ladylike manner. My studio was sparkling, ready for the Mom & Me Quilter’s Tea guests to take a tour. Their parents won the experience at a silent auction for my son’s school. Books autographed, check. Camera, check. All done a day before. My elder son and husband were away at a Boy Scout caving trip, so it was just me and my younger son. Who came to me in the middle of the night saying, “Mom, I don’t feel so good.” Poor guy. He was up all night with a stomach bug. Tea postponed, check. After all, fiddle-dee-dee, tomorrow is another day. Like the frosting on those cupcakes? Then you won’t want to miss February’s Color-of-the-Month show. It’s the first Tuesday in February, only 7 days away! This entry was posted in Artist Dates, Color Lessons, Home, Quilting and tagged artist dates, Color Lessons, Home on January 26, 2010 by mpeagler. 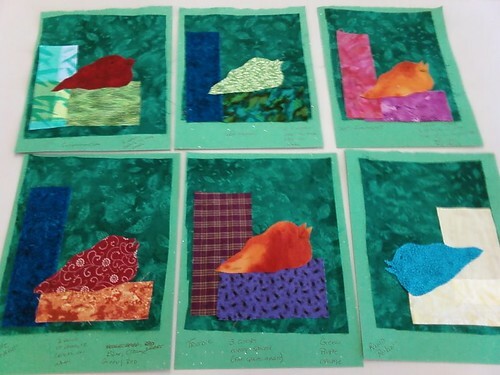 Gallery Show and Fundraiser – The Colors of HOPE: Author and quilter Maria Peagler, with local quilter Mary Litrel, will show selected quilts from their collections at the gallery on July 2-4. Ms. Peagler will give a talk on Friday evening at the gallery for the Woodstock Friday Night Live event. 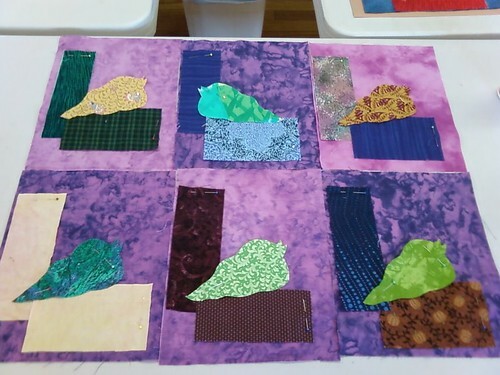 “Color Artistry in Quilt Creation,” 7 pm. A quilt by Mary Litrel, entitled ” Esperanza,” will be donated for a raffle, with funds being raised for the HOPE Center in Woodstock. The final raffle drawing and winner will be announced immediately following the Freedom Run in downtown Woodstock on July 4. Raffle tickets will be sold at Ann Litrel Art, and at Cherokee Women’s Health Specialists in Canton, www.cherokeewomenshealth.com. If you’ve never visited downtown Woodstock, you owe it to yourself to check it out: it is absolutely charming. Quaint. All those adjectives for a downtown area you can stroll through and never want to leave. It’ll be a great way to spend a hot summer day and evening. Ann is an excellent artist, and has a collection of her paintings at her website. Don’t miss the Woodstock Depot series, where she paints the local train depot in the styles of great masters Monet, Van Gogh, and others. That takes talent. Then check out my own Learning from the Masters series on the great quilters of today and what we can learn from them. Gather your quilting girlfriends and make it a girls’ nite out to benefit a great organization. This entry was posted in Artist Dates, Color, Learning from the Masters, Quilting and tagged art, art quilts, artist dates, gallery, Woodstock on June 18, 2009 by mpeagler. But tell them I sketch, or even better if they see me sketching, and they are truly facsinated. They stop what they are doing to watch me or even come over to watch my penstrokes on the page. Sketching really does attract a crowd. An orchestra, art, family, and a beautiful day. A perfect summer recipe. And a by-the-way note: Annette, one of my students at the Stitching Barn Color Mastery class, tried my recipe for the Five Bean Pot from my May/June email newsletter. She noticed, however, it called for only four cans of beans. The can of baked beans is the large, double can, and I count that as the fifth can of beans. Since I have kids at home, I try to make my recipes as kid-friendly as possible, so that’s why only four types of beans in the Five Bean Pot recipe. Annette loved the recipe and you will too! You can see my newsletters over here. And sign up for them here. This entry was posted in Artist Dates, Journals, Quilting and tagged artist dates, Journals, Quilting, sketching on June 15, 2009 by mpeagler. Everything You Wanted to Know About Color . . . .
Ok, well maybe not everything. After all, it’s only an hour. But what an hour it will be. 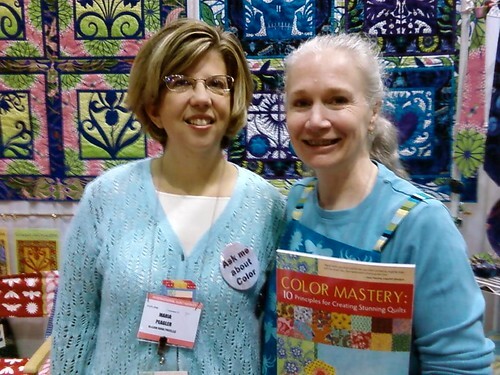 I’ll be chatting with Morna McEver Golletz in the Professional Quilter Cafe, and of course the topic will be my favorite: color in quilts. What an artist date! What I’m most excited about is having a one-on-one where we can really dig deep into the subject. Color is so intimidating for most quilters that this is a jewel of an opportunity to really “get” color in a way they never have before. 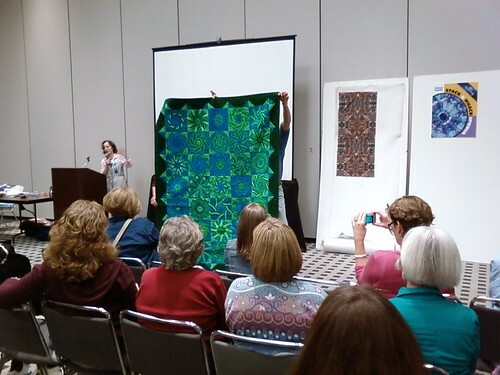 And since this is a Professional Quilter teleclass, we’ll be talking about color not just for quilters, but also for instructors who teach color classes, pattern designers and how they can use color more effectively in their samples, and for shop owners and how they can really help their customers in choosing colors for their quilts. Hope you can join us. It’s only $9.95 and that’s for both the teleclass and downloadable MP3. You can’t even buy a dinner out for that. So stay home on Thursday, Jan. 15 and join us at 8p.m. Eastern. Here’s the link. See you there! This entry was posted in Artist Dates, Breaking Quilting News, Color Lessons, Color Mastery and tagged artist dates, Breaking Quilting News, Color Lessons, Color Mastery on January 9, 2009 by mpeagler. The December issue of Mary Engelbreit Home Companion arrived in my mailbox, and my favorite part of the magazine is the artist profiles. But I had to share with ya’ll how much this magazine is now about quilting and fiber arts. Almost this entire issue is about fiber art of one kind or another, profiling Amy Butler and her home, the same way it did Heather Bailey months ago. Mavis Leahy, an art quilter is also featured, as well as some yo-yo-stockings. Wow! Terrific potential for artist dates on these pages. Go pick up the latest issue and get inspired! 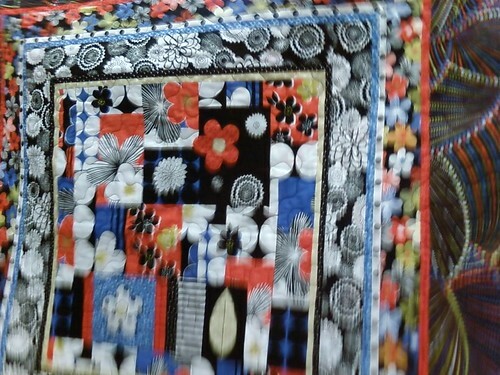 This entry was posted in Quilting and tagged artist dates, Quilting on November 11, 2008 by mpeagler. Why these colors? They trickle down from Paris runways, and seep into fashion, magazines, and the ultimate arbiter of all things designer: Target. Really. When you see Rubbermaid, Daytimers, and hangers at Target in trendy colors, you know those are what’s hot. This entry was posted in Artist Dates, Breaking Quilting News, Color and tagged artist dates, Breaking Quilting News, Color Lessons on November 3, 2008 by mpeagler. Katie Pasquini Masopust has a new book on creative quilt design called Design Explorations for the Creative Quilter: Easy-to-Follow Lessons for Dynamic Art Quilts. All about taking inspiration from photos and artwork and using them as a source for your quilts. Katie professes not be good at drawing realistically, so she takes her photographs and sketches and turns them into abstract art. How’s that for turning a challenge into an opportunity? 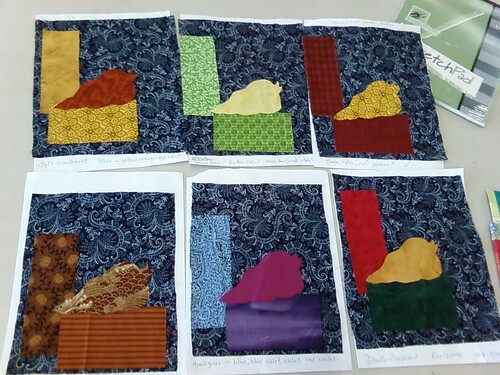 Also learned that Katie machine quilts her quilts in sections, Marti Michell-style: Machine Quilting in Sections. Her art quilts aren’t that large by most quilting standards, but she says it makes quilting much easier. I have Katie’s previous book, Color and Composition for the Creative Quilter: Improve Any Quilt with Easy-to-Follow Lessons and enjoyed the quilts and the lessons in the book. Even though I didn’t want to make her quilts, I did learn from the exercises. That’s what I believe the best quilting books do: teach you how to improve the quilts you want to make, not how to make someone else’s quilt. 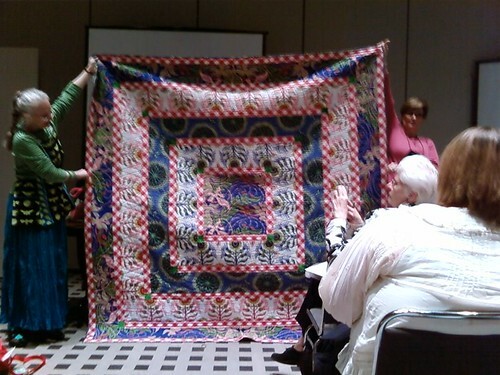 While the Fall Quilt Market 2008 Schoolhouse session I attended was short, Katie showed impressive innovation, humor and accessibility. She doesn’t get so serious about her art quilts that she forgets to have fun with them and her students. This entry was posted in Artist Dates, Blog, Breaking Quilting News, Color Lessons, Learning from the Masters, Quilting and tagged artist dates, Breaking Quilting News, Learning from the Masters, Quilting on November 2, 2008 by mpeagler. This entry was posted in Quilting and tagged artist dates, Learning from the Masters on October 31, 2008 by mpeagler. 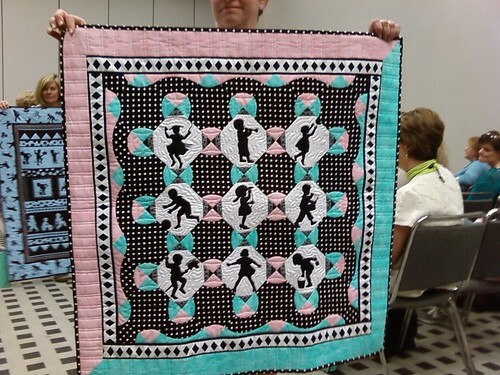 Here’s Bethany Reynold’s newest quilt from her book Stack-N-Whackipedia. Sounds like she’s made lining up the fabrics and cutting easier than it was before. I’ve never done her stack-n-whacks, but she sounds like she’s a great teacher. If you can take a class from her, do it. This entry was posted in Artist Dates, Quilting and tagged artist dates, Quilting on October 30, 2008 by mpeagler. Lights – Camera – Showtime! 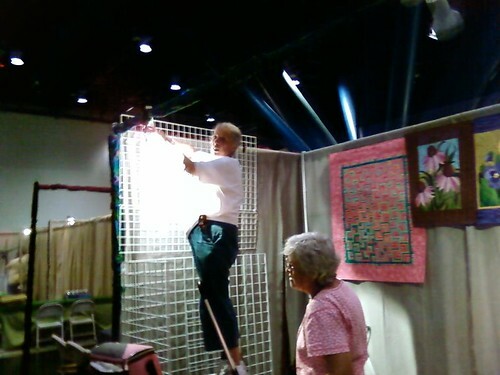 Ever wonder what happens before all the glitz and glamour of Quilt Market? Here are two wonderful and generous ladies, Eileen Sullivan of The Designer’s Workshop, and Jennifer Armor of Jennifer Armor Garments, setting up their booth. And here we are later when everything’s looking beautiful, well-lit, and gorgeous at a book signing for Color Mastery. Oops – our photographer was so excited she couldn’t stand still when shooting! 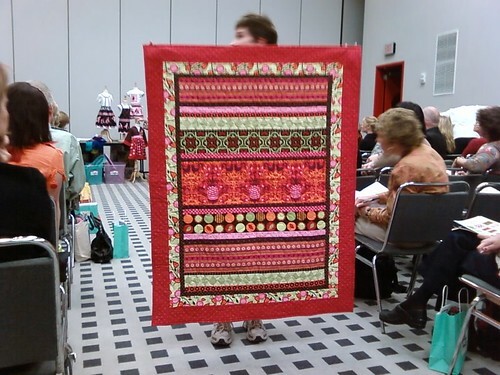 Up next: photos of new quilts from the best and latest designers! This entry was posted in Artist Dates, Breaking Quilting News, Quilting and tagged artist dates, Breaking Quilting News, Quilting on October 27, 2008 by mpeagler. 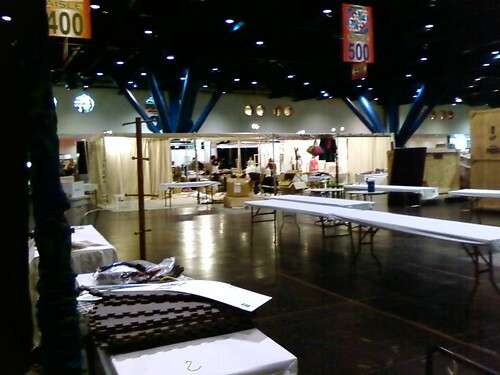 I’m in Houston, TX this week and I’ll be giving you a behind-the-scenes look at the giant trade show to the quilting trade: Fall Quilt Market. From this show come the new fabrics, books, patterns, and designers you’ll be seeing in your quilt shop in 2009. And you’ll hear about them here first! All the commotion starts tomorrow, so today I hit three art museums in Houston’s Museum District: the Lawndale, the Center for Contemporary Craft, and the phenomenal Museum of Fine Art. It was there that I actually gasped when I turned corner after corner to see artists whose works I had seen scattered throughout different museums and exhibitions, but never together in one place: Monet, Matisse, Renoir, Van Gogh, Botecelli, Munch, Jacob Lawrence, Romare Bearden, Carrie Mae Weems, Mary Cassett, Georgia O’Keefe, William de Kooning, and the list goes on. It was terrific and a great way to start this trip: inspired by the best. 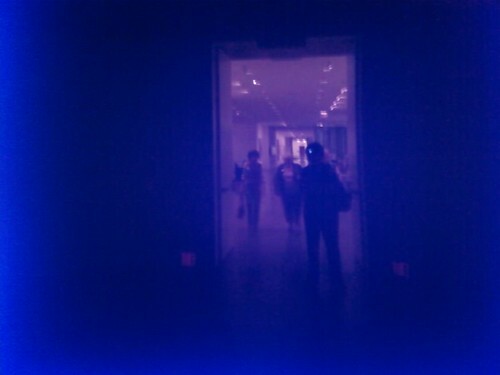 In the photo above I’m in the neon underground tunnel connecting the two buildings that make up the MFA. Truly, if you are ever in Houston, this is a must see! This entry was posted in Artist Dates, Breaking Quilting News, Learning from the Masters and tagged artist dates, Learning from the Masters on October 23, 2008 by mpeagler. All quilted and ready for facing. Sometimes I love the backs of my quilts even more than the front, because I can see the quilting so much better. I don’t want the quilting to overwhelm the design and colors on the front, but I sure do love the machine quilting detail you can see in the back. Hmm, sounds like series potential there, doesn’t it? This entry was posted in Artist Dates, Machine Quilting and tagged artist dates, machine quilting on October 3, 2008 by mpeagler. Today we have a special guest here at Quilts & Creativity: Elizabeth House, student and designer of the newly-released LizzyDish from Andover fabrics. I’ve always wondered how a fabric starts from an idea to actually making it onto the printing press, and Elizabeth shares her thoughts on design, color, and how she envisions using LizzyDish in projects. Enjoy! 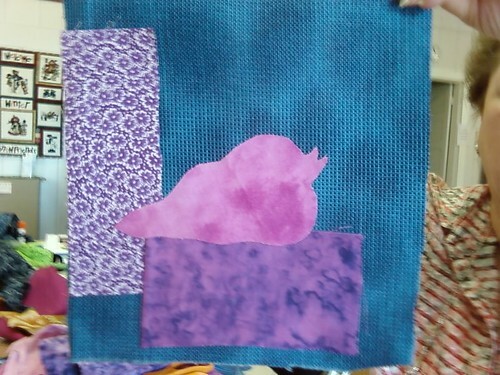 Q: Please tell us a little about you: how did you get started in quilting and fabric design? A: My name is Elizabeth House, and I am from Humble, Texas. I’m graduating in December with a BFA in Printmaking. I am also a book artist, and textile designer. I have a real love for Vince Guaraldi, beautiful design, cleverness, and sleeping. 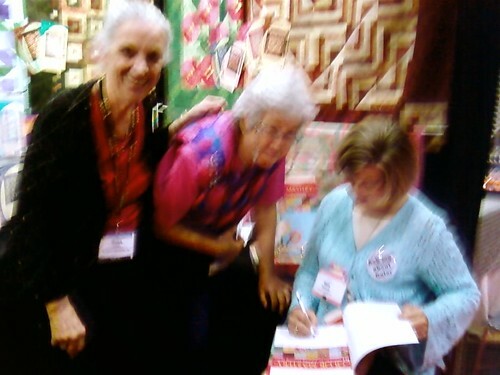 I got my start in the quilting world from my mother (editor’s note: Cherri House of Cherry House Quilts). 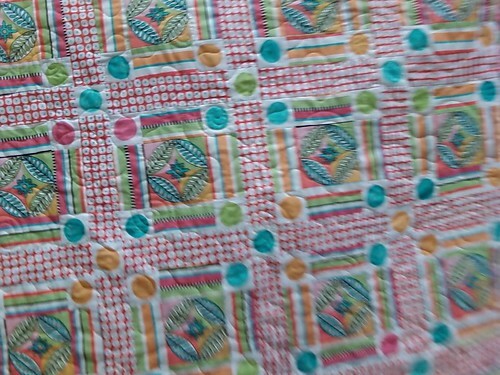 She has quilted for as long as I can remember, and for as long as I can remember I wanted to design the fabric she was using. I was very young when I decided that I wanted to design fabric, but it wasn’t until recently that I actually started quilting myself. I think almost a year to date! But I got my actual start in fabric design last year (2007) at Fall Market. You can read all about it here! Q: What was your inspiration for LizzyDish? A: I have such a fascination with images from the 1950’s and 60’s. I feel like if there was a time in this past century that I could have been alive, like 20-30’s it would be those decades. A kid in the late 30’s and working in the 50’s. Ok. I will put it like this: I would either like to have been a Vaudevillian, Fanny Bryce, OR, a 1950’s concept artist, Mary Blair. So, just add those things plus a love for entertaining, baking, cooking, all together party throwing and you have LizzyDish. I wanted it to feel like you found it. You were handed down something or you went thrifting or garage sailing and there was a dish towel, a box of old recipe cards, a cook book, or a set of mixing bowls that reminded you of what was, how your mom, or your grandmother cared for things. I saw those things in my grandmother’s house. An exquisite attention to detail that we, for the most part, pay very little to no attention to. The mothers of the fifties were renaissance women. They wore aprons, everything matched, meals were timed. There is definitely a resurgence of this, the timing, the aprons, the details, but it was more of a calling then and I wanted LizzyDish to feel a part of that era. I want to be a modern renaissance woman of that same caliber. Q: You’ve written in your blog that you keep about 3-5 journals going at the same time. Is one for color? How do your journals influence/inspire your work? A: It’s gotten a little out of control, the notebook thing. I keep one for a specific project that I am working on, which has grown into large sheets of folded paper that I keep meaning to bind, but have really been liking the ability to just lay them all out and look at them together… one is for notes… but I seem to be getting lazy, because they are all starting to blend together which requires me to carry all of them at all times. They greatly influence my work, I would never throw away any of my journals or sketch books. They are like lessons and I am grateful to be able to turn to them to gain inspiration, as well as avoid previous pitfalls. Q: You were inspired by Fiestaware, retro kitchen appliances, and the state of Hawaii for your colors. Can you elaborate on how you selected those colors? Do you choose colors intuitively or use color theory to guide you? How does your color chart guide you? A: I feel like the more familiar you are with color the more intuitively it comes. I don’t go about things looking for a triadic color scheme or to be monochromatic. It usually occurs to me later that I have created split compliments or analogous color ways with no actual intention. I would say color is probably one of the most important things to understand. For this group, because the inspiration for the images was so strong I wanted to play with colors of the same era. The color chart is a guide, after I choose colors in the beginning I place them all in the chart, and I take away and add from there. It’s just a key to the whole thing, like a color map. Q: Have you made any projects yet with the LizzyDish fabric? How do you envision it being used? What fabrics would you recommend to use with it? A: I have designed several projects, but I currently don’t have the fabric in my hot little hands. As soon as I do, all my sketches will come to fruition. As far as how I see it being used, I see it as much more than novelty prints. It would work in anything from quilts, to aprons, all the way to children’s wear. There are no limits to what LizzyDish can, and should be used for. I would use it with solids. But I am very excited to see what people create. If I had a house, I would upholster a breakfast area in it. I’ll be saving some yards for when that day comes. Thanks Elizabeth for stopping by today and chatting with me about designing fabric. It’s great insight to peak into the mind of a designer and see how a fabric goes from idea to the quilt shop! This entry was posted in Artist Dates, Color Lessons, Quilting and tagged artist dates, Color Lessons, Quilting on September 29, 2008 by mpeagler. In class this week, Patsy wasn’t sure if she had enough contrast between her bird and the background elements. So I shared one of my favorite and easy tips: take a photo of your work and look at it with your digital camera. You get distance from your work, and you can differentiate colors much more easily. So, if you don’t have enough contrast, or one fabric refuses to play well with others, the camera tells you so. 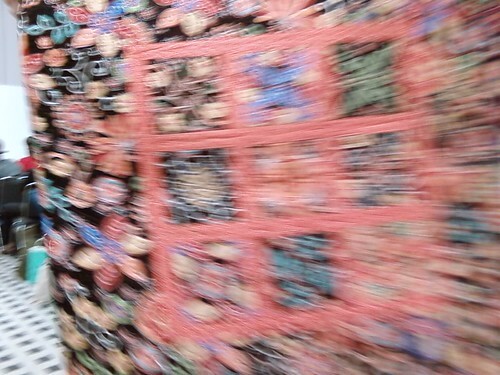 You can also look at your quilt in the mirror and it gives you the same perspective. Try it, and see how it works for you. This entry was posted in Artist Dates, Quilting and tagged artist dates, Quilting on September 25, 2008 by mpeagler. My favorite insights as an instructor are when I see the actual moments my students really get it: that singular moment when they realize they’ll never see color, fiber art, or quilting quite the same way. We created one of these fiber art pieces for each color harmony, starting with the same main color. When you finish, you have a sampling of what’s possible around the color wheel using the same color as the starting point. It was an exercise that really opened the eyes of the fantastic ladies taking the class. 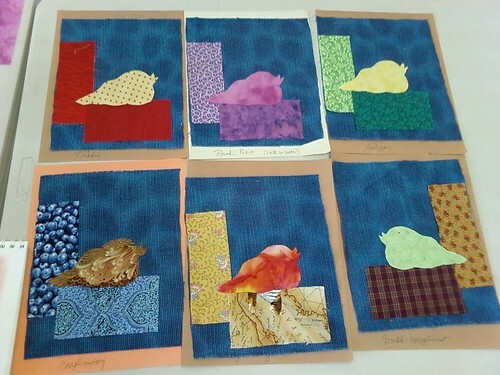 These are my birds, and I started with the same red-violet fabric each time. Because it’s a tertiary color, it’s difficult for most people to identify, and it’s complement is yellow-green, also a challenging color because it’s so bright. I pulled off the contrast well, but they are all too cool. Too much green, and not enough reds and oranges for me. The challenge is to use fabrics in your stash, and I brought my scraps with me and let students use those as well as their own. I will probably tweak these later. I took these photos on my camera phone and uploaded them via Flickr, all from my cell phone. Technology makes my life and my work so much more fun! This entry was posted in Artist Dates, Color Lessons, Workshops and tagged artist dates, Color Lessons, Workshops on September 23, 2008 by mpeagler. Click on the Email Newsletter tab in my blog header to sign up. Let’s make a date to meet in your Inbox! This entry was posted in Artist Dates, Breaking Quilting News, Quilting and tagged artist dates, Breaking Quilting News, Quilting on September 16, 2008 by mpeagler. This entry was posted in Artist Dates and tagged artist dates on September 3, 2008 by mpeagler.